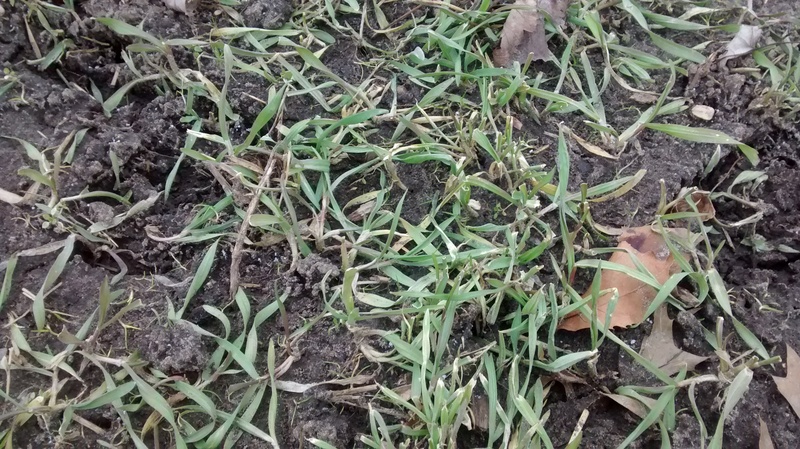 If we have a mild late-fall, my rye may have enough time to germinate and get established. If not I’ll have learned a valuable lesson about putting off planting my cover crop. I have an area in the garden that I will not be able to plant this year. Instead of letting it stay fallow and grow weeds, I planted buckwheat. It’s something I’ve done through the years whenever I’ve been unable to use an area for one reason or another. Buckwheat is a fast growing plant that will out compete most weeds. Planting buckwheat allows me to place-hold that unused garden area while reducing weeds at the same time. It also takes up mineral nutrients from that soil that are unavailable to other plants. Those minerals are incorporated into the growing plant. Eventually, I’ll cut down the buckwheat and till it into the soil. As it decomposes, all those minerals will be released back into the soil in a form that other plants can use. Buckwheat is not an actual wheat at all. Wheat is a type of cultivated grass, buckwheat on the other hand, is a broad-leaf plant. While regular wheat forms inconspicuous flowers that are hidden, buckwheat grows a profusion of while flowers. Those flowers are very attractive to honeybees and other pollinators. The dark, strong flavored honey that results from buckwheat nectar is highly prized by some honey aficionados. Many years ago when I first started beekeeping, that dark buckwheat honey was considered a low quality product. Now that has all changed and buckwheat honey is often sold at a premium. 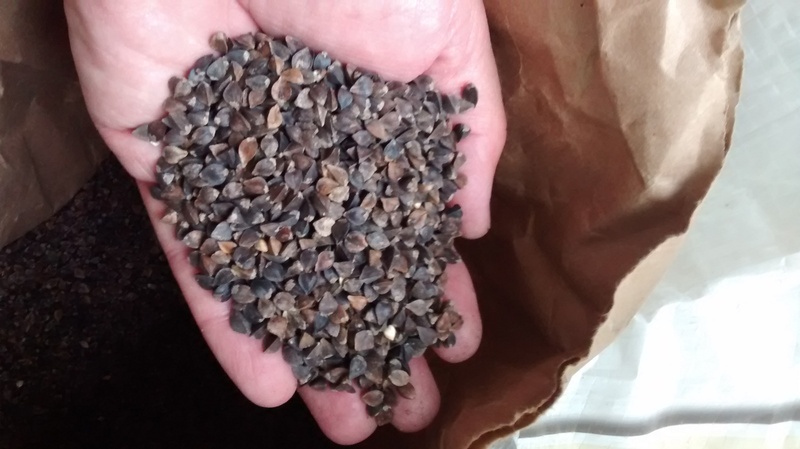 Buckwheat seeds have a distinctive pyramid shape. Planting buckwheat is a simple process. Till the spot you’re planting, spread some seed over the area and lightly rake it into the soil. Figure on using a couple pounds of seed per thousand square feet. In a few days you’ll see the young buckwheat plants emerge from the soil. 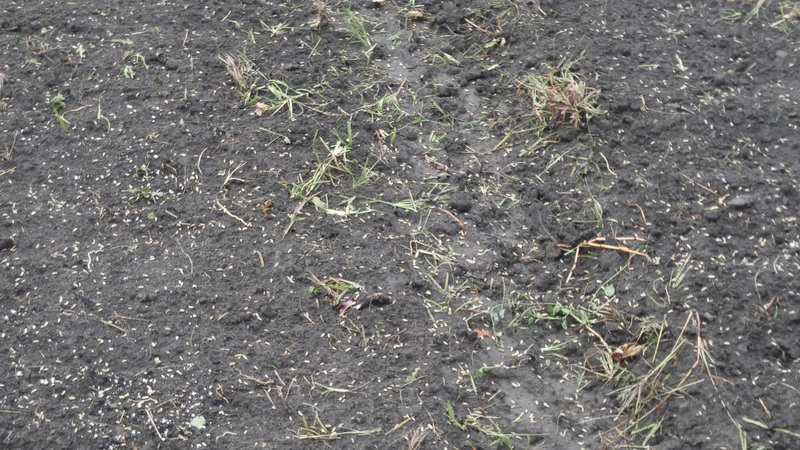 If after a week or so of growing, some of your planting looks a little thin, sow more seed to fill in the area. Buckwheat can cover a space up to ten inches in diameter but an open spot larger that a foot across will allow weeds to grow. I’ll keep you updated on the progress the buckwheat makes through the growing season. The rye cover crop I planted last fall made tremendous growth this spring. The plan all along was to till it into the soil before planting a week or so before planting. Timing is important when it comes to tilling under a cover crop like rye. The plants grew and entered the “boot stage” of growth, forming flower/seed heads inside the stalk. This is the ideal time to till rye into the soil. At that stage the plants are about 20-24 inches tall. You can feel the flower/seed head forming inside the stalk during the boot stage. I thought the garden was quite fertile, and it is, but the spots that received a little heavier application of compost last fall are much greener, taller and are developing seed heads earlier. It’s a good demonstration about the benefits of compost. As you would expect, areas with more compost were taller and a deeper green color. The plants were too tall for the rototiller to handle on its own. I had a couple of options, either kill the rye with an herbicide like Roundup, which is what most of the conventional farmers do, or mow it. Since I’m trying to keep it an organic garden, I mowed. Twenty inches tall sounds like a lot for a mower to handle but rye is very tender and juicy in the boot stage — they are almost all water. If I had mowed it before the boot stage, the plants would have grown back just like a lawn. If I waited too much longer, the plants would have been tougher and drier as they begin to form seeds. That would have made it much more difficult to till and would leave too much coarse plant material in the soil. The chopped up rye dried and left a fine textured residue that was very easy to till. The stubble after mowing is about five inches tall. Notice, there are no weeds present. Plant growth stage was not the only thing I was checking, I was looking at soil moisture too. All the rain we had last week left the soil temporarily saturated but it dried fairly quickly. Tilling a garden that is too wet destroys its soil structure negating most of the benefits that a cover crop provides. 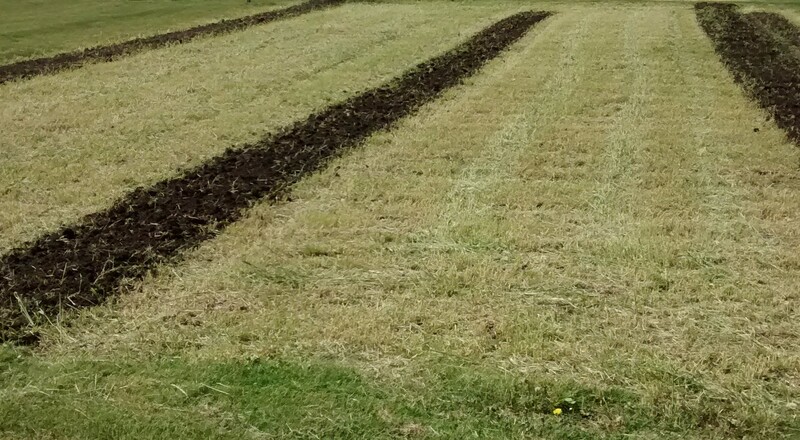 The rye along with winter freezing and thawing improved the soil structure by forming loose aggregates of soil particles leaving plenty of space for roots to grow. Another very visible advantage to this cover crop was the lack of weeds this spring. By this time the garden would have been full of all kinds of broad leaf weeds and grasses. Dandelions would have come and gone by now. The rye did its job and out-competed virtually all other plants giving me a head start over the weeds this year. Our mild autumn temperatures have accelerated the growth of fall-planted, over-wintering, cover crops. Back in October I wrote about planting cereal rye as a cover crop in my garden. Since then the crop has germinated and made excellent progress toward establishing itself. When rye seed germinates, it emerges out of the soil as a single shoot. As time goes by and temperatures are conducive to plant growth, leaves begin to form on the main shoot. The rye plants are about four inches tall. After a couple of weeks of growth, the plant enters the “tillering” stage of development. Rye is a bunch grass, a self-descriptive term meaning that the plant grows in tuffs or bunches instead of spreading by over-the-ground stems called rhizomes. To spread and take advantage of growing space, the bunch grasses form extra stems called tillers. 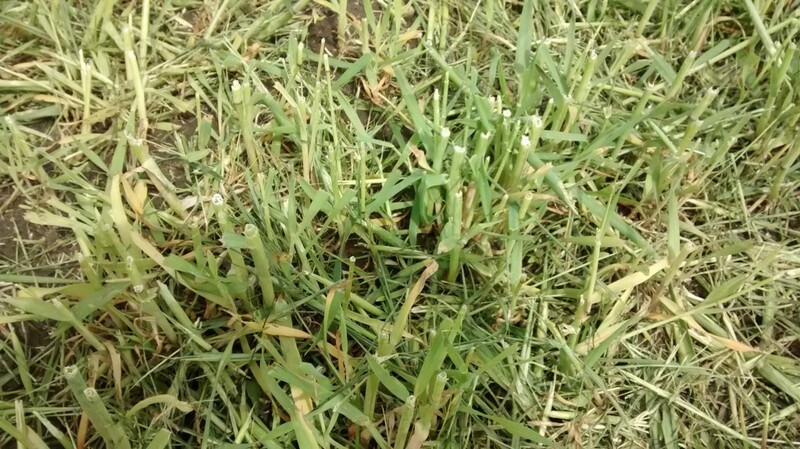 Tillers grow from the main stem of the plant. 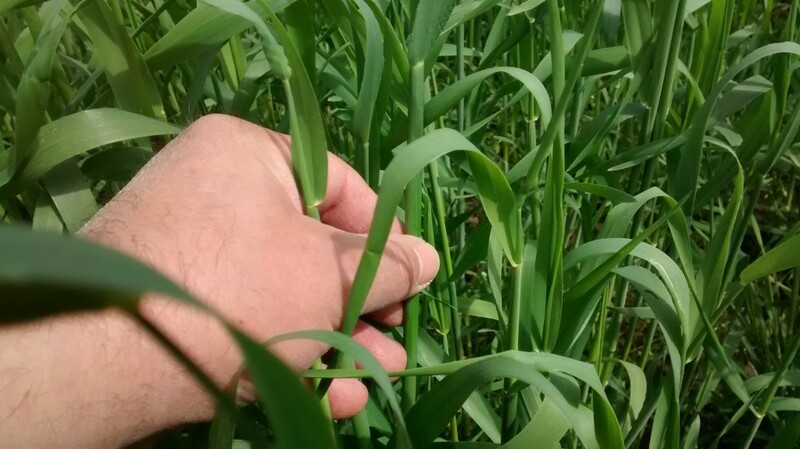 When you look at a rye plants and see it staring to form dense tuffs, that growth you see is the tillers. Each tiller has the ability to form it own roots. In that way the plant has the ability spread vegetatively, essentially producing baby plants along side the main plant. 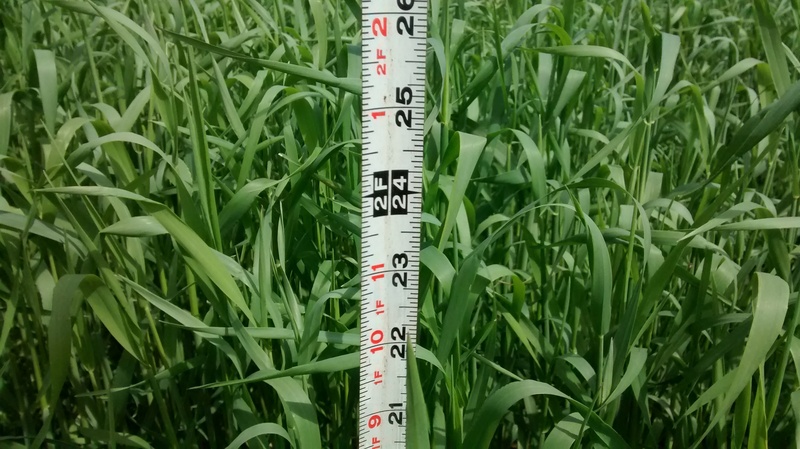 Farmers are concerned about encouraging tillering because the more fully-developed tillers the crop has, the greater the yield. 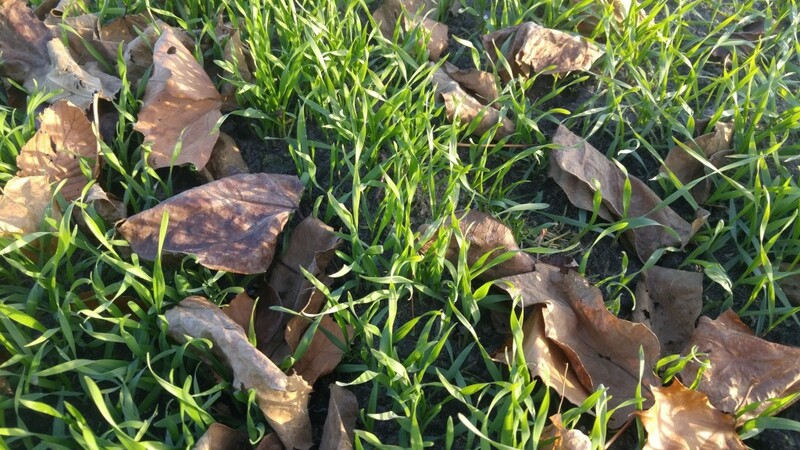 Extra tillering allows the plants to fill in bare areas thereby compensating for thin stands or weak germination. My rye is is in the early stage of tillering and should be in fine shape going into the winter.